Probably because it was purpose-built, the holiday destination of Flaine is one of the most user-friendly ski resorts in France: compact, with easy access to the pistes, and a location that ensures exceptional snow conditions. Flaine is situated beneath Mont Blanc, near Geneva, at the gateway to 'Le Grand Massif', one of the best ski and snowboard areas of France. From the nursery slopes, to an easy glide on the nearly nine mile (14km) blue Cascade run, or the off-piste challenge of the Combe de Gers, Flaine is a trend-setting, family-orientated resort that caters for all levels of skiers and boarders. Consisting of concrete apartment blocks built on three levels along the slopes, at an altitude of 5,250 feet (1,600m), in the centre of a natural bowl, this, the youngest resort in the French Alps, may not sound particularly appealing. Flaine may not conform to the archetypal image of the Alpine village, but it has been architecturally designed for comfort and convenience, and visitors are amazed at how the buildings blend in with the limestone of their surroundings. The three levels, Flaine-Foret, Flaine-Forum and Flaine-Front de Neige, are connected by elevators and pedestrian trails. The centre is car-free, with restaurants, bars and services grouped around two central shopping plazas. All activities are either close and easily accessible, or in the resort centre. There is also a cultural centre where classical and jazz music events are scheduled, a library and an art gallery. Though not exactly a fashionable destination, Flaine is increasing in popularity, particularly as a family ski resort, and caters very well for children. The majority of Flaine's marked ski runs are suited to intermediate skiers, but there are also some challenging adventure trails for experts. The breathtaking view from the cable car station atop Les Grandes Platieres gives a perspective on the variety of terrain, lifts and trails spread out in three directions. Flaine is connected by a system of lifts to the more traditional resorts of Les Carroz, Morillon and Samoens, offering altogether a huge ski-circus of 78 lifts and more than 160 miles (257km) of trails. There are 16 black, 54 red, 47 blue, and 15 green pistes, along with a 'hot' snowpark for snowboarders (the Jampark), and about 40 miles (64km) of cross-country. There are several excellent ski and snowboarding schools available for beginners, and excellent nursery slopes close to the resort. The altitude virtually guarantees good snow coverage from December to May. Holidaymakers do not come to Flaine to shop, but to ski, as is evidenced by the fact that this is not a resort sporting designer boutiques or glitzy malls. Shopping arcades contain the necessities for visitors; those who find they need sunglasses or gloves, will easily find some, but those set on fashionable shopping sprees will be disappointed. There is a supermarket and bakery for self-caterers, and services like a post office and hair-stylist. Serious shoppers will have to save their credit cards for a spree in Geneva on the way home. Most holiday visitors to Flaine come on package deals, which include dining in the hotel, but for those who want a change of scene, Flaine has about two dozen establishments offering a variety of typical French cuisine, traditional fondues, or pizza and snacks. Being primarily a family holiday resort, Flaine is not a hectic party spot. Après ski is enjoyed mainly at the two most popular pubs, The White Grouse and The Flying Dutchman, both with a good atmosphere. Some low-key disco and karaoke is also available. 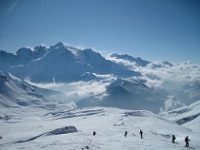 Off the slopes Flaine offers many diversions to holidaymakers looking for a bit of diversity. There is a cinema, ice-rink, indoor swimming pool, fitness centre, bowling alley and indoor climbing wall. Snowshoeing and ice driving are popular. While the skiing is great for novices and intermediates, experts might find the slopes lack challenges. Although the scenery is magnificent, Flaine lacks the charm and atmosphere of a traditional Alpine resort.